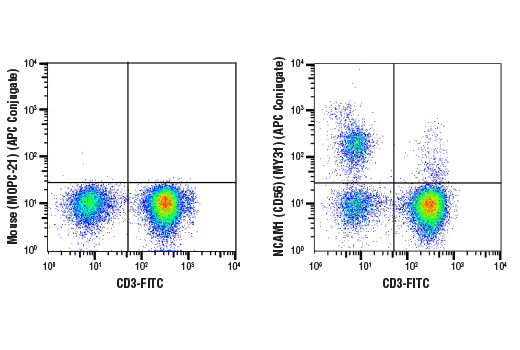 Flow cytometric analysis of live human peripheral blood mononuclear cells using NCAM1 (CD56) (MY31) Mouse mAb (APC Conjugate) and co-stained with CD3 (UCHT1) Mouse mAb (FITC Conjugate) #86774 (right), compared to concentration-matched Mouse (MOPC-21) mAb IgG1 Isotype Control (APC Conjugate) #49083 (left). NCAM1 (CD56) (MY31) Mouse mAb (APC Conjugate) recognizes endogenous levels of total NCAM1 (CD56) protein. This antibody detects an epitope within the extracellular domain. This Cell Signaling Technology antibody is conjugated to APC and tested in-house for direct flow cytometric analysis in human cells.